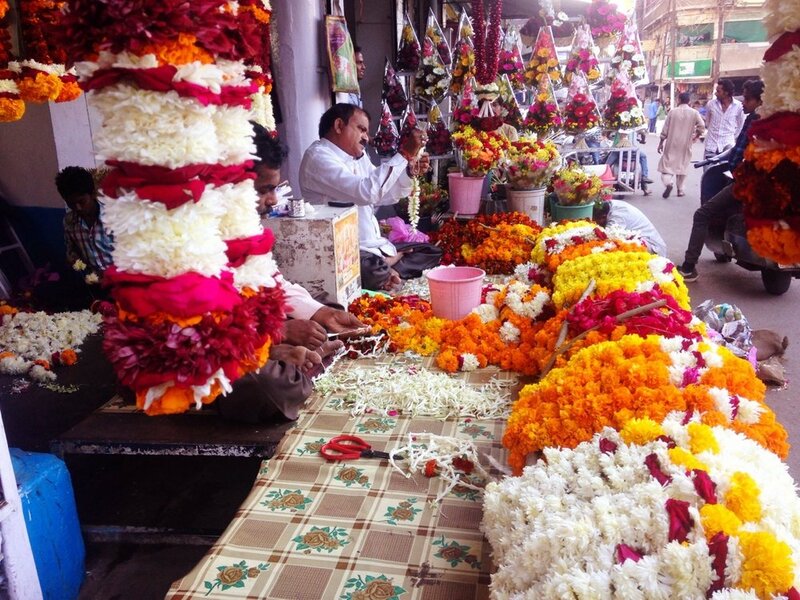 Here florists do a lazy job of making jasmine garlands - they string them together using a needle. I remember my Grandma doing it differently with more finesse: the flowers in bud stage placed diagonally and woven together. Here, this is what it is and this is how it shall be; the florist ignores us, chattering away on his Nokia and deftly piercing flower with needle and string. The streets are unbelievably clean. People quietly sweep the streets gathering flowers, leaves in newspapers. I don’t see where they dump this waste, a vegetable seller with a cart brimming over with greens impatiently kept asking me to get out of his way. I am a clumsy ladki in places like these. Remember Monsoon Wedding where Vijay Raaz chabaos a single sunshine yellow marigold? There are gendaphool garlands piled up everywhere. Weddings indeed look better in shades of orange, gold and marigold.